Is spirulina a plant? Heck no. I don’t know why everyone keeps classifying it with plant foods. Maybe its because spirulina uses photosynthesis that people think its a plant. But its NOT a plant. Its not an animal. So then what the heck is it? Spirulina is a type of bacteria called cyanobacterium. Its commonly called blue-green algae. And no not all algaes are plants. Algae simply refers to aquatic organisms that are capable of photosynthesis. This would include a variety of organisms. Spirulina is made up of single cell bacteria and is extremely tiny. The only reason you can see spirulina is because the bacteria groups together to form large colonies. The individual organisms are either rod or disk shaped, more commonly rod shaped and often spiral around. Although spirulina is a rich dark green color, its main photosynthetic pigment is phycocyanin (among others), which is blue. This is what they used to capture the light that they use for energy. Not only does spirulina produce its own food through photosynthesis just like plants do. But it also contains the same photosynthetic pigment that plants have, chlorophyll. Plants are multi-cellular eukaryotes. Spirulina is single celled organisms. 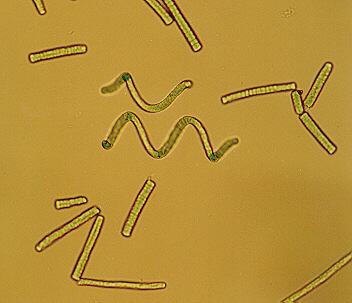 It is BACTERIA classified as cyanobacteria. Many types of cyanobacteria are toxic and need to be avoided. But spirulina happens to be the most nutritious food on the planet, per weight anyhow. Check out some of the benefits of spirulina by clicking “Benefits” at the top menu. I hope you have learned something. Its not a plant! If you have any questions or comments leave them below. PrevWhat is the Best Way to Take Spirulina Powder?